Tyres, call to get yours! Whatever type of vehicle, if you need a tyre for it, you can find it here at Carterton Tyres Ltd.
We are the local Chipping Norton experts for all size and spec for tyres and we specialise in fitting tyres from all leading brands, supplying many excellent tyres at an affordable price – even your trusty wheelbarrow can have an overhaul with a new tyre! Carterton Tyres Ltd doesn’t just supply tyres though. Come to us for your exhaust or battery. We are sure to have something to keep your vehicle happily motoring even in the harsh winter months. When we fit new tyres, we can also ensure that the tracking/ alignment is as accurate as possible by using our state of the art equipment. We can also carry this out for imported vehicles. We take your safety while driving seriously and will endeavour to make sure that there is nothing to hinder your day to day journey. 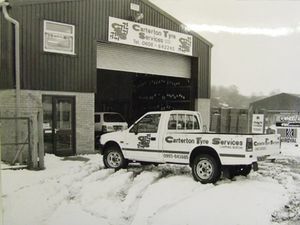 So, when your vehicle is in need of new tyres, exhausts, batteries and you live within Carterton, Burford, Stow on the Wold or Chipping Norton area your journey only needs to be as far as Carterton Tyres Ltd.
Get in touch with the friendly team of professionals here at Carterton Tyres Ltd.
Visit our Contact Us page to find details of how to get in touch. You can either email us using the handy link or call the number showing.